It earned medals. Lots of medals. At its core, General Mills was a flour milling company. 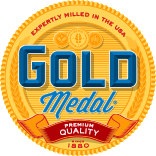 Many brands dotted our history, but Gold Medal flour remains the most well known. In 1880, Washburn Crosby entered several grades of flour in the first International Millers' Exhibition in Cincinnati, Ohio. 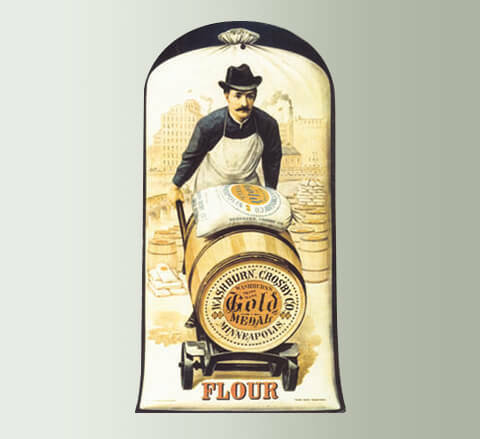 Those flours won the gold, silver and bronze medals, and the company subsequently changed the name of its highest-quality flour to Gold Medal. Gold Medal was eventually shipped worldwide. Not as easy as it sounds more than 100 years ago. Shipping flour in sacks proved to be difficult. For one, sacks were loaded and unloaded repeatedly, often with hooks. What's more, the holds of ships could be damp. An 1878 letter from Percy Young, a London commission merchant for Washburn Crosby, revealed "flour shipped in barrels received in better quality than a later delivery of flour in sacks." Packaging, it seems, has always mattered. So have customers. But the world was bigger back then, when communication was slow. Our customers could be like family. "Our foreign customers ... are not merely buyers, but correspondents and friends of long standing …" said R. F. Bausman, who was in charge of our European, Mediterranean and North African markets in 1923. Find out more at goldmedalflour.com. Washburn Crosby established a European sales office in 1920. By 1923, our flour markets included Central and South America, the West Indies, West Africa, Brazil, Europe, the Mediterranean and North Africa. 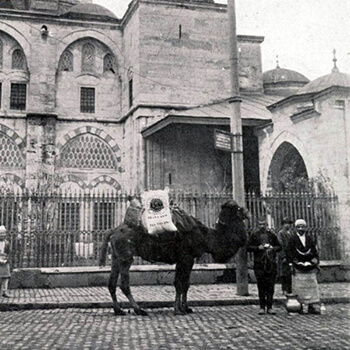 Here, it's delivered in Constantinople. Washburn Crosby was one of the first American companies to export flour to Great Britain, in 1878. 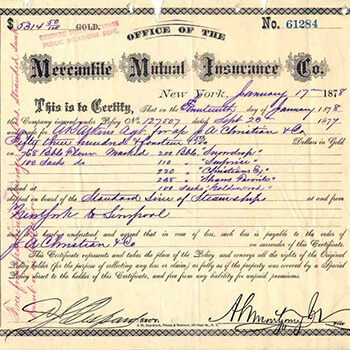 At left is an insurance certificate, dated January 17, 1878, for flour shipped from New York to Liverpool, England. 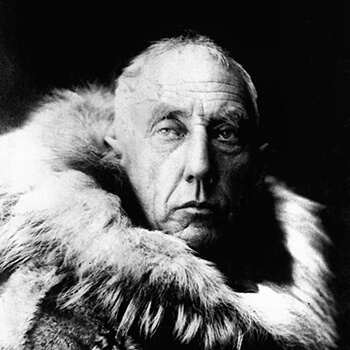 Norwegian explorer Roald Amundsen is recognized as the first person to have reached both the North and South Poles. He led the first expedition to traverse the Northwest Passage as well. On that adventure, he brought 35 tons of Gold Medal flour to feed his 10-member crew. 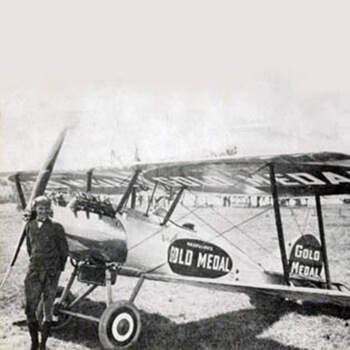 Charles "Speed" Holman, a well-known Minnesota pilot, turned his airplane into a flying billboard for Gold Medal in 1924. The plane was a familiar sight at county fairs in Minnesota and surrounding states. Tiny Gold Medal Flour sacks, attached to small parachutes, were dropped to crowds below. Later, small boxes of Wheaties parachuted from the plane. Laurine Williams meant to send an old coupon to General Mills in 1984. She set it aside and didn't mail it until 2012. When she was 87. 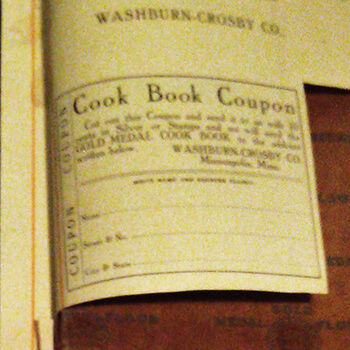 Seems that she found an original 1910 coupon that her mother had for a Gold Medal cook book. We redeemed her coupon. The cook book had been reprinted in the '80s. "I never expected to get one, but it was fun," Williams said.